Solution: Energy profile for conversion of methyl isonitrile (H3CNC) to its isomer acetonitrile (H3CCN).How does the energy needed to overcome the energy barrier compare with the overall change in energy for this reaction? Energy profile for conversion of methyl isonitrile (H3CNC) to its isomer acetonitrile (H3CCN). 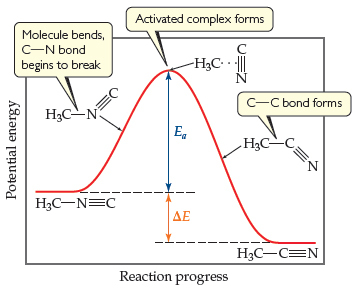 How does the energy needed to overcome the energy barrier compare with the overall change in energy for this reaction?